The chemical and physical properties of ozone are described, along with its microbial inactivation mechanisms. The various methods of ozone production are compared, including their economic and technical aspects. 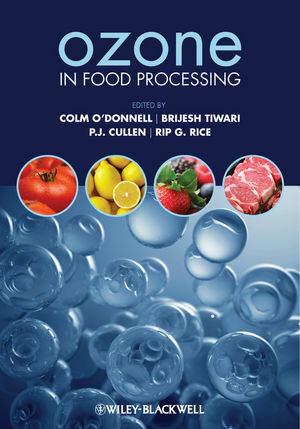 Several chapters are dedicated to the major food processing applications: fruit and vegetables, grains, meat, seafood and food hydrocolloids, and the effects on nutritional and quality parameters will be reviewed throughout. Further chapters examine the role of ozone in water treatment, in food waste treatment and in deactivating pesticide residues. The international regulatory and legislative picture is addressed, as are the health and safety implications of ozone processing and possible future trends. Professor Colm O’Donnell, School of Biosystems Engineering, University College Dublin, Ireland. Dr B.K. Tiwari, Department of Food and Tourism, Manchester Metropolitan University, UK. Dr P.J. Cullen, School of Food Science and Environmental Health, Dublin Institute of Technology, Ireland. Dr Rip G. Rice, RICE International Consulting Enterprises, Sandy Spring, Maryland, USA.